Just about ready for Charlotte. Got the alignment done tonight. Anything that is not OE vertical 10 points. Anything that is not OE horizontal 10 points. Our car claims 20 points. They have about 10 RV spots that are first come first serve. They are in Nascar turn 4 pretty far away from our Paddock. Most people just dry camp without power hook ups. No showers is a true statement. What all was checked in tech? More than just a visual? This is 20 points. 10 for the horizontal splitter and 10 for the vertical air damn. One thing this series for sure is, Endurance racing. The championship race should be 24 hour. or 10 + 10. Had a strange fix today. We swapped in our 3.0 over 1 year ago. Ran all of last year with the same exhaust with no issues. We finished 5th twice and had an overall good year. 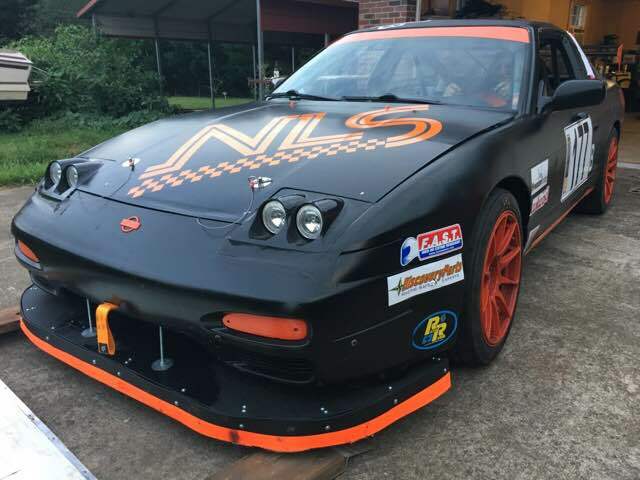 Well, at Road Atlanta last month about half way through the practice day the car decided not to rev past 5000. We spent the rest of friday and into the night trying to figure out what the issue was. At about midnight we found that the exhaust was restricted where the y pipe went from 2 to 1. Basically when i built the exhaust i inserted the pipe too far into the y pipe. Over the course of 2018 the heat and exhaust pressure had closed up the pipe. That friday night the guys just did an emergency fix so we could race Saturday. They just pryed the pipe back open and pulled it out about an inch. We today i finally cut it open and removed the piece. I have no idea how the car ran as good as it did with the exhaust so restricted. Moral of the story is anything is possible. I am excited to see how the car runs with a properly functioning exhaust. The third photo is from Road Atlanta looking into the y pipe. The first photo shows how far into the exhaust it was. The second photo is the piece i will put on the shelf to remind me of what not to do. @LuckyKid The software you are talking about sounds interesting. I have been using a very crude spreadsheet in excel to try something like that. I have to input avg. lap times and update it throughout the race. Don't let the forum nazi's bother you. You came into the series and beat a lot of teams that have been doing it for a long time. That is sure to ruffle some feathers. Your team is a welcome addition to the series. But damn that car screams! LOL! You may want to quiet it down just for driver comfort. Thanks for the full race recap and thanks for admitting where you need to change some things. We have one driver that needs to back it down a notch when it comes to making passes. He knows it and is going to change. Every type of racing has different on track etiquette, figuring it out sometimes has a learning curve. I stand corrected. I guess visually looking at cams could determine if they were aftermarket of not. I was not aware that factory reground cams were 0 points. Something we may look into. thanks @Huggy! LOL! I want it to be clear i could care less about any specific car. I just want engine rules to actually be enforced. Pulling a valve cover to look at cams is a waste of time. Unless we get some degree wheels and dial indicators out there, cam rules are useless. When you say they were "torn down with no issues" what was checked? Are we now able to check displacement and max cam lift? I could care less about any one car. I'm just curious as to what can be checked in tech. Until tech can check cam lift, duration and or displacement there is no need to protest an engine. Simply because we don't have to tools to do it. If a rule can't be enforced, it may as well not be a rule.